Although winter has been pretty warm here this year, a writer friend of mine posted a photo of a new little fireplace/stove she had installed in her study. It looked so lovely and cozy and I was immediately jealous. But then it occurred to me that I had money my dad had given me for Christmas still unspent. And since my study is the coldest place in my house - which is a good thing in the summer when it's sweltering here, but not so good in winter - why not get one for my study. I currently have a little Pelonis space heater to make it comfy in there when I'm writing and don't want to crank the heat up in the entire house. So, I did my research. I found that the cost of running an electric fireplace was far less than using the heat pump that is part of my AC system. And even the smallest units will heat up to 400 square feet easily. Well, my whole house is only 800 square feet! Add to this the fact that the best - or only - place to put it is right between my living room and study - it could heat both and be seen from both rooms. I started looking. Home Depot had only one small one and I wasn't impressed. Apparently this is not the the time of year to be on the hunt for them because right now all the summer stuff is showing up in the stores. 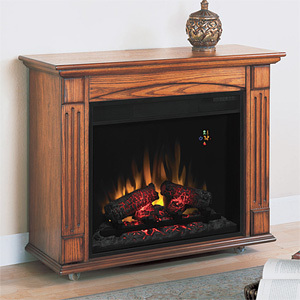 So, I went online, found this lovely little oak fireplace and ordered it. It was even on sale - better yet. This morning I was excited because according to the tracking number it was on the truck and out for delivery. Sure enough the Fed-ex man pulled up out front shortly after lunch and unloaded my box. I hadn't eaten lunch yet, but that didn't matter - I was anxious to see my new acquisition and began unpacking at once. Tons of styrofoam later, I revealed my prize. Only problem was that my prize was not all in one piece. I don't mean that it was a "some assembly required" item. I mean that it was falling apart. I found screws, chips of wood and wood pegs that should have been glued firmly into holes to hold the assembly together. I might still have been inclined to get out my wood glue and put it back together, but I also noticed that the metal firebox was damaged. This has an electric heating element inside and the very last thing I need is a fire hazard. Talk about disappointment! The form has been filled out, photos have been submitted and a case number assigned to my complaint. And now I wait with a big box sitting in my living room. And tomorrow the temperatures are predicted to return to seasonally cold. I really would have liked to fire up that thing, make myself a cup of tea and curl up with a good book to watch the make believe flames and get cozy. Guess I'll have to settle for warm stockings and my fleece lined hoodie. For anyone who might wonder...the replacement has arrived and been installed. And it's WONDERFUL! Not as wonderful as a real fireplace would be, but that, in my little bungalow can never happen so this is the next best thing. It made my study quite cozy on the first chilly days after it arrived and I'm so enjoying both the ambiance and the warmth.